Rocky the dog was just days away from being put down after his rescuers were finding it nearly impossible to find a home for the highly energetic pup. 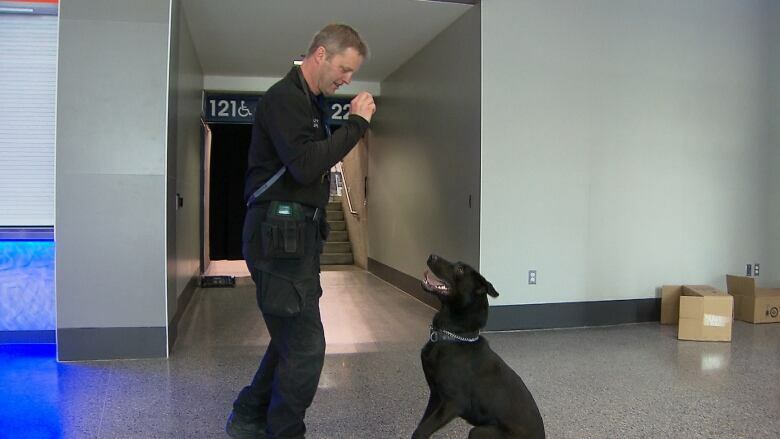 But it was those qualities that made him well-suited for his new job as a security dog at the Bell MTS Place. Rocky the dog had already gone through a couple of foster homes, and his rescuers were finding it difficult to find a forever home for the highly energetic pup. But it was those qualities that made him well-suited for his new job — as a security dog at the Bell MTS Place. 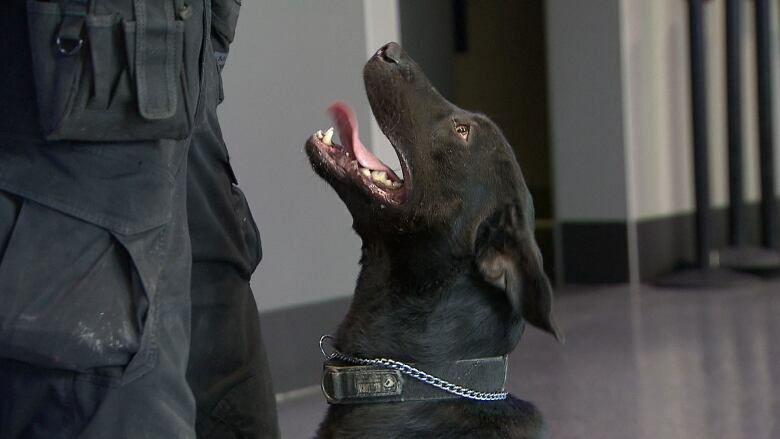 David Bessason, security dog trainer and handler for True North Sports and Entertainment, says the company was looking for a dog that most people really can't handle: "The dogs that are a pain at home — that are getting into things, they're mischievous, they're high drive," he said. Manitoba Mutts suggested Rocky. Within minutes of meeting the young mutt, Bessason says he knew he'd found what he was looking for. The dog was originally named Burt, but Bessason says his wife renamed him after Sylvester Stallone's iconic film about an underdog boxer. Bessason said Rocky's story has opened his eyes to the fact that there are probably other dogs out there whose owners are in a similar situation. "We have to do our best to actually maybe help these people out, to train them and to understand that that dog can have a purpose," he said. Rocky came to Manitoba Mutts as a stray when he was seven months old, says Colleen Holloway, a volunteer spokesperson for the dog rescue. The dog had been living in a remote northern community in Manitoba. Holloway says the rescue organization had spent months trying to train and rehabilitate Rocky, and had had a difficult time finding a home that would take him. "We had been investing in seven months of care with Rocky and we were kind of looking at, what are his options, what are the odds of finding that perfect home?" she said. "We found it with David and his job here working security, so that is a needle in a haystack and we found it so he was a very lucky dog." 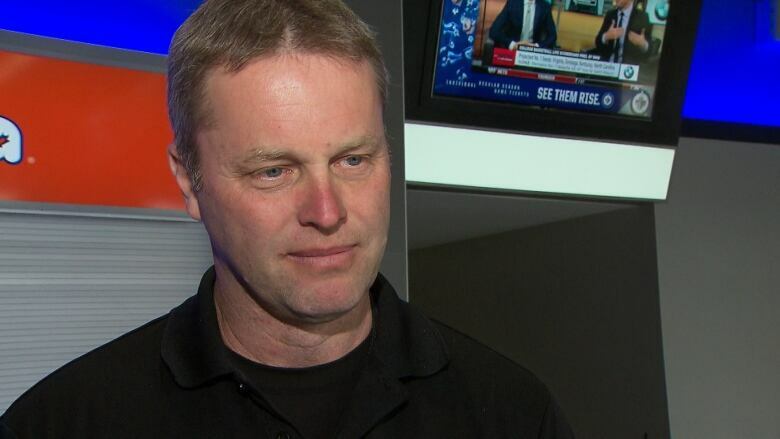 An earlier version of this story, based on information provided to True North Sports and Entertainment security by Manitoba Mutts, indicated that Rocky was scheduled to be euthanized before being adopted. In fact, Manitoba Mutts later clarified that Rocky was scheduled to remain in boarding and was not scheduled to be euthanized.